The 31.06-carat flawless deep blue Wittelsbach-Graff diamond is on display at the American Museum of Natural History until early next year. UPPER WEST SIDE — The world's most expensive diamond is taking a vacation in one of America’s most expensive zip codes, where it will be ogled by visitors to the American Museum of Natural History. The Wittelsbach-Graff Diamond, a very rare 31.06-carat deep blue gem, went on view on Thursday in the museum’s Harry Frank Guggenheim Hall of Minerals after changing hands — some of them royal — many times since its first appearance in Europe in 1664. "The diamond is so special in part because it has such a long history and is one of only a few dozen that came out of India and became crown jewels," said Dr. George Harlow, the Natural History Museum's curator of minerals and gems. After being mined in India, the stone was given by Spain’s Philip IV to his daughter Infanta Margarita Teresa upon her engagement to Emperor Leopold I of Austria, according to Harlow. The gem was then passed on to Leopold’s heirs after the princess’ death and made its way into the Bavarian crown jewels in 1722 when it entered the Wittelsbach family. The jewel remained part of the royal jewels until the end of World War I.
Christie's auctioned important jewelry from the Bavarian crown jewels, including the Wittelsbach, in 1931, after which the diamond was recorded as unsold and seemingly disappeared until it was identified by a jeweler in 1962. In 1964, the stone was sold to an anonymous private buyer in whose family it remained for more than three decades. In December 2008, the Wittelsbach was sold at Christie's London to jeweler Lawrence Graff for just over $24.3 million, the highest recorded price for any jewel at auction. Graff had the stone re-cut to return it to its original status as a flawless, fancy deep blue diamond. 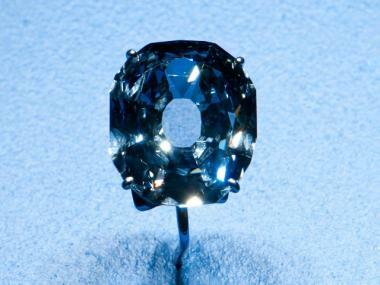 The Wittelsbach-Graff is in very rare company, as it is one of only three large true deep blue diamonds, including the world famous Hope Diamond, according to Harlow. It was rumored that the Wittelsbach-Graff and the even larger 45.52-carat Hope Diamond were cut from the same original stone, but that theory was debunked earlier this year. Still, Harlow said, that because of the gem's similarity to the Hope diamond, the Wittelsbach-Graff has received extra attention. "The most famous gem on the planet is the Hope Diamond because it's at the Smithsonian and it's the most important object they own," Harlow told DNAinfo. "In the public's eye, a large blue diamond like the Hope is going to have some similarities in terms of how people will think about it." The Wittelsbach-Graff diamond will be on display at the American Museum of Natural History through January 2nd, 2011. The AMNH is located on Central Park West at 79th Street.